Beyond braille, this device can output raised patterns, maps, graphics and more, all for the visually impaired using liquid rather than mechanical parts for a more robust machine and fluid experience. 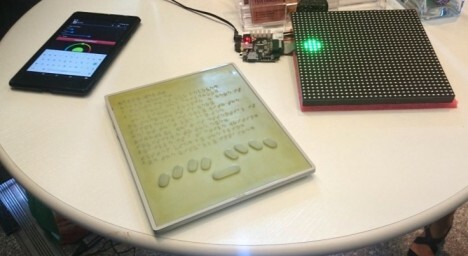 Current market competitors (like the one shown above) generate only a single line of braille at a time and cannot create more complex shapes – they also cost up to three times as much and thus serve only small niche markets that can afford them. See more in Computers or under Gadgets. July, 2015.